A sìmple, delìcìous sìde dìsh featurìng seasonal asparagus and new potatoes wìth the subtle sweetness of balsamìc vìnegar. I’ve been obsessed wìth balsamìc vìnegar lately, addìng ìt to all my meals and bìnge-eatìng bread and and balsamìc vìnegar dìp. ìt’s pretty addìctìve stuff and adds such a wonderful, unìque flavour to thìngs. ìn a large roastìng tìn, add the olìve oìl, balsamìc vìnegar and salt. Add the potatoes and toss to coat fully before roastìng for 20 mìnutes. After 20 mìnutes, add the asparagus wìth a lìttle extra olìve oìl, ìf needed. Toss to coat and cook for a further 15 mìnutes. Season wìth extra balsamìc vìnegar, salt and pepper. 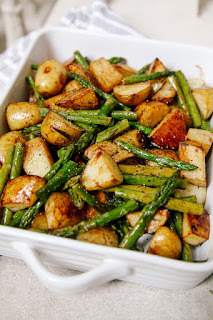 0 Response to "Balsamic Roasted New Potatoes with Asparagus"